The crystal clear Wifi 7” LCD Monitor is a perfect addition to any driver that needs assistance backing up. See the whole world behind you in rich colors. It is also an LCD monitor so it is very light as well as thin. In addition, it has two video inputs so you can connect a camera and a game system or DVD player. This monitor is compatible with all our cameras and any car; it connects to any power source or a cigarette lighter. 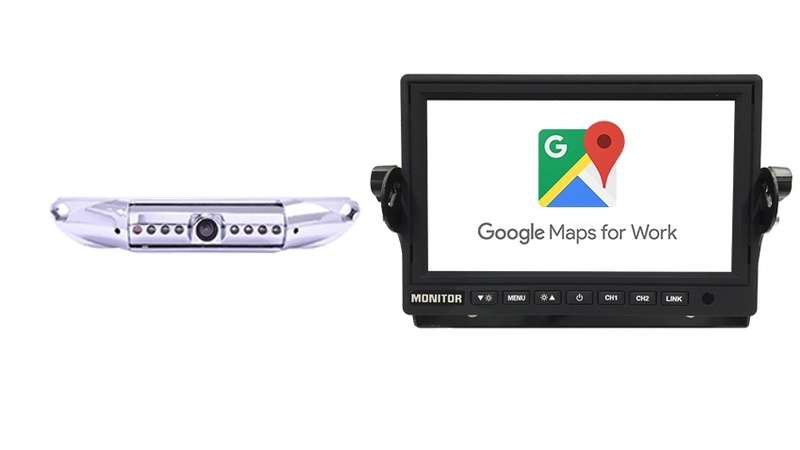 It can mount on your windshield or dashboard (mount included). Super easy installation. The monitor also allows you to LINK to a smartphone such as an iPhone or Android or even windows. The monitor will Mirror anything you phone shows, so you can use this monitor to see everything in your phone, pictures, or videos, or anything else such as the internet. You can also stream music just like to an Apple TV. The possiblities are endless, the sky is the limit to what you can do with this monitor and your smartphone. This is also heavy duty which means it can take a beating and be exposed to the weather. If you are using the monitor for normal bumpy driving you can use our regular monitor but this one is for those who need something that will stand up to a lot and its made for the toughest and roughest conditions. The Black License Plate camera is mounted by screwing your current license plate screws through its brackets; it’s a very simple installation. The camera can also be adjusted by angling the camera up or down so you can get the perfect view for your car. The CCD lens is the clearest and highest quality camera TadiBrothers sells, also known as an HD Backup Camera. There is no need to drill any holes or install mounting brackets. The camera has a 120° angle which is best for Cars, SUVs, and Trucks. With 120° everything behind the vehicle can easily be seen, it is also color, waterproof and has military grade night vision. The camera and mount are made of steel for ultimate durability in the roughest weather conditions. This item includes a 15 Foot cable, if its going on an RV, BUS or any other vehicle longer than average SUV we recommend upgrading to our premium extension cables located on the top right of the page. "I didn't expect for the image on this monitor to be that great. I was so impress when I used the second input to connect a dvd player. I love it!" "The picture quality on this monitor is excellent. Crystal clear view. " "I needed to replace the monitor on my old Voyager, Voyager wanted $800 for just the monitor and i was able to buy it from Tadibrothers for a fraction of the price with all necessary adapters. The crew was very helpful over the phone and i got the item with same day shipping. Now thats service! " "I purchased a 3.5" but upgrade to this 7" monitor and I'm so glad I did! Amazing screen. If you're looking for a monitor to purchase. This is a must!!"